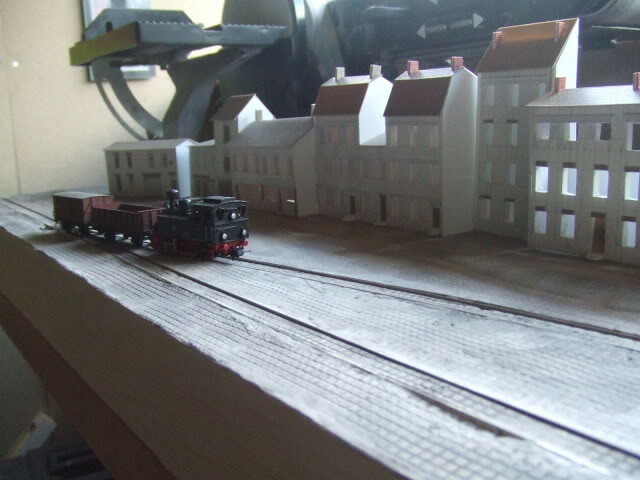 I'm planning my first layout, well scene really as I don't have space for a layout. It's going to be a small quay side scene with a single line splitting into two running down the pier. I would like to have the surface of the pier finished with a cobble/tram-set and stone block effect and I'm wondering what to use for this effect. There is a plywood frame and support underneath. Das clay seems ideal for this effect but is it likely to lift/separate from the plywood when used in a large piece? Maybe I should try something like Sculptamold, would that stick better? grs wrote: Das clay seems ideal for this effect but is it likely to lift/separate from the plywood when used in a large piece? You could always drill holes in the plywood to provide keys for better adhesion. I might experiment with a few ideas first, see how they look. A few panel pins tacked into the ply might give anchorage too. The Caledonian Basin looks great. I found a video of someone how used cork, cutting it into each block, be he was working in a larger scale, might be a bit fiddly at 00 scale, I'll sample that too anyway. I've used DAS for this sort of effect (I'll try to find a pic it was a few years ago). I used two techniques to 'stick' it down, I rolled it straight onto PVA glue, so literally stuck it down. The other technique I used was to use the tape you use to cover joints between plaster board before plastering, it provides a nice key for the DAS. One thing to watch out for is that DAS shrinks like mad if you let it dry out too quickly, and if you've rolled it thin it'll start drying almost immediately. Once you've rolled it out or squidged it into place put a damp cloth over it and keep the cloth moist until the DAS dries out, don't be tempted to accelerate the drying process. You can form the cobbles whilst still moist, or engrave afterwards.